Do you want to complete an easy home makeover without the hassle of a full renovation? Siding replacement will do the trick. A fresh new material in a different color with trim to match will instantly transform the look of the whole exterior. Metal Siding – Steel and aluminum siding are easily maintained, sturdy and resistant to fire. From an aesthetic perspective, metal siding can also be designed to mimic the look of wood. Wood Siding – Choose from clapboard, shakes and shingles. Enjoy the rich look of wood that will last for decades to come with proper care. If you’re looking for a fresh paint job on trim and other components to complement a new siding installation, our team can take care of that as well. Composite decks made of 75 percent wood fiber and 25 percent polypropylene look like wood and offer better performance. Paint or stain them as desired. PVC decks are low-maintenance and won’t swell or shrink. PVC offers great longevity and resistance to rotting and cracking. Cedar decks are cost-effective, beautiful and naturally rot-resistant. The warm color of the wood will fade to a misty gray tone over the years. 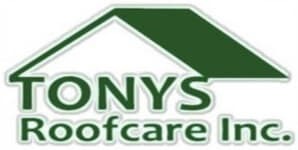 When it comes to transforming your home’s exterior, the skilled crew at Tony's Roofcare Inc. does it all. Call (253) 841-7779 or submit our online contact request form.